Eating right and exercising are key to making sure mom is healthy and happy. You don’t have to have a perfect diet to make perfect breastmilk! But you do need a good diet and exercise routine to make sure you have the energy and mental strength to take on motherhood. Many moms are worried that they don't eat well enough to make good quality breastmilk. No matter what you eat, you will make wonderful milk for your baby. 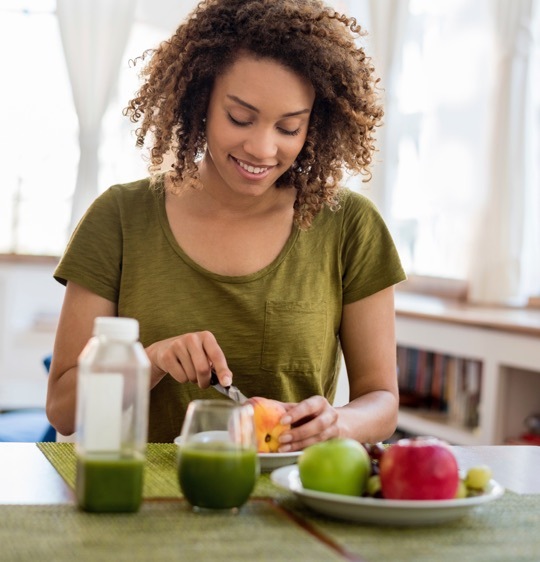 It's more important that you eat a good diet to take care of yourself. Eat to satisfy your hunger, at least 1800 calories a day. Drink to satisfy your thirst. If you are not usually thirsty, make sure you sip on water each time you nurse your baby. Limit caffeinated drinks to no more than three servings per day. 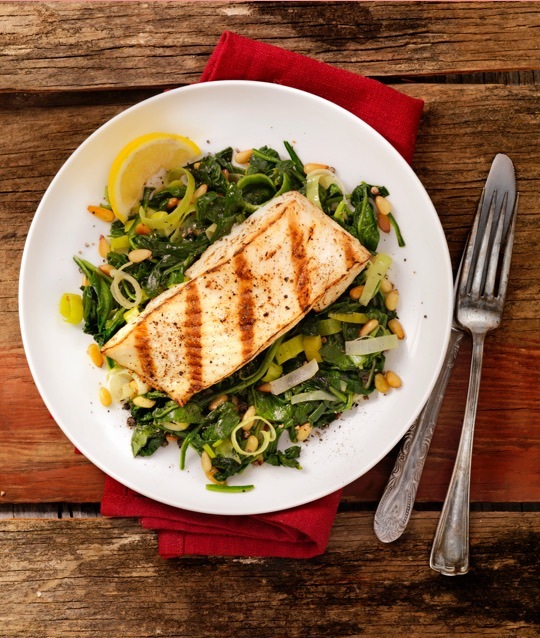 Eat fish—it has healthy fat that is good for you and your baby. Avoid fish that are high in contaminants, using the guidelines below. Avoid: shark, swordfish, tilefish and king mackerel. Limit to 6 oz. a week: albacore tuna, tuna steaks, freshwater fish caught by family and friends. Eat 8 to 12 oz. a week: any ocean, coastal and other commercial fish/shellfish like shrimp, salmon, pollock, catfish, canned light tuna & mackerel, tilapia, mahi mahi, scallops, crab, lobster, sardines and anchovies. Besides the four types of fish to avoid, there are no other foods you should avoid while you're breastfeeding. Eating a wide variety of foods while you're breastfeeding actually introduces your baby to more tastes. This makes it more likely he will accept a wider variety of foods at an older age. Sometimes you might find your baby seems to have a reaction to something you eat. If your baby seems fussy or colicky after you eat a certain food, just avoid it for a few days or a few weeks. Most babies outgrow these sensitivities quickly. If baby continues to be fussy/colicky when you eat a certain food, he might be having an allergic reaction. This happens more frequently in families with a history of allergies (including food, inhaled and contact allergies). Dairy food is the most common food allergy in babies. If you suspect your baby might be having this reaction, stop drinking milk and eating other dairy foods for 2-3 days to see if that stops the problem. If it doesn't help, see a breastfeeding counselor for help about what to do next. Lots of moms find that getting some exercise helps them feel like themselves again. A little exercise goes a long way toward helping you get your pre-baby body back. It can also help fight the baby blues and more severe types of postpartum depression. You don't have to do much – 30 minutes of exercise twice a week is good for you. Not sure where to start? 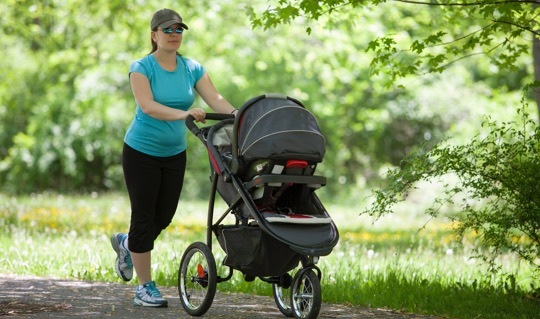 Get outside and push your baby in the stroller. Or ask a friend, family member or babysitter to come over at a certain time of the day so you can go to the gym, ride a bike, do a workout tape, do some yoga or go for a run all by yourself. Sometimes just getting out of the house can make a big difference. Pregnancy and motherhood bring a lot of different emotions. It’s normal to feel all of these emotions, but sometimes you just need help. Hey mom, come have some fun!